My favourite chocolate bar as a kid was Aero, hands down. I also liked Caramilk and enjoyed a Kit Kat, but the second best for me was Bounty. 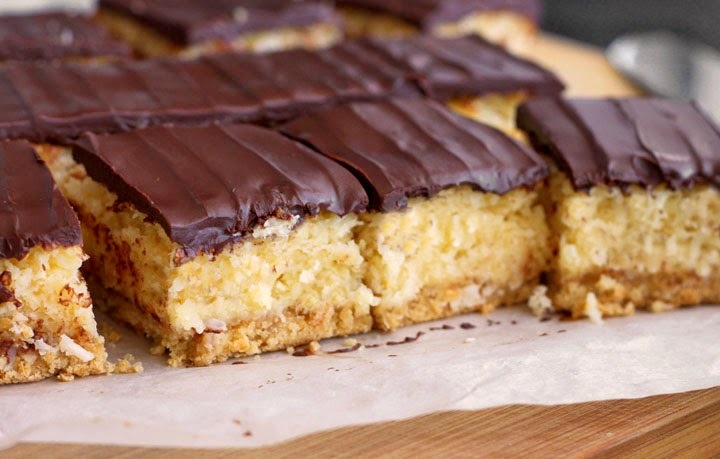 I discovered Bounty a bit later in childhood, but learned to love it quickly. I remember the most significant Bounty that I ever purchased was at the corner store in Little Italy where my grandparents lived. They handed over a $20 bill to the group of us grandkids and sent us off in search of sweetness, as grandparents do (gotta love 'em for it!). I thought I'd sway from my usual and grabbed a Bounty. Great decision. Loved it. Hooked. It was a texture thing too - soft, slightly sticky coconut filling and smooth chocolate coating. It was a flavour thing too though because who can deny chocolate + coconut? I didn't care for Oh Henry or Snickers. I hated peanuts. 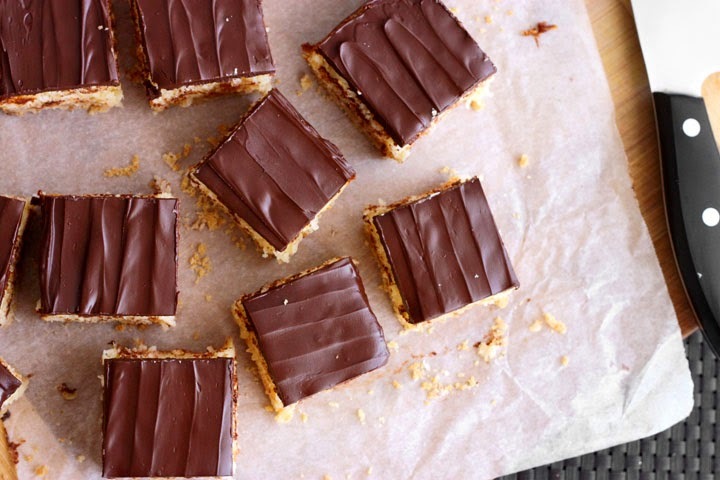 These squares are just like that bar - moist, chewy, slightly gooey filling with a smooth chocolate coating. Super thick too! I supersized it. I've added a slightly crunchy and buttery brown sugar base. The filling gets its stickiness from creamy, gooey, gorgeous sweetened condensed milk. When we use this ingredient, we get a package deal. We get sugar and milk, and we get the functionality of a syrup. So, most of the work is done already. Because of all the sweetness from the milk, make sure you use unsweetened coconut. And because of all the sweetness, make sure you use salt! Balance, folks. Another note - make sure you use shredded, not desiccated coconut. The desiccated stuff tends to be finer and will absorb much more moisture due to its larger surface area (smaller particle size = larger surface area). This means that the mixture will be a bit drier. Also, it's a texture thing again - shredded gives us more chew. Eggs help to hold this thick layer together, but also adds protein. Protein gives extra chewiness to this sky high filling. 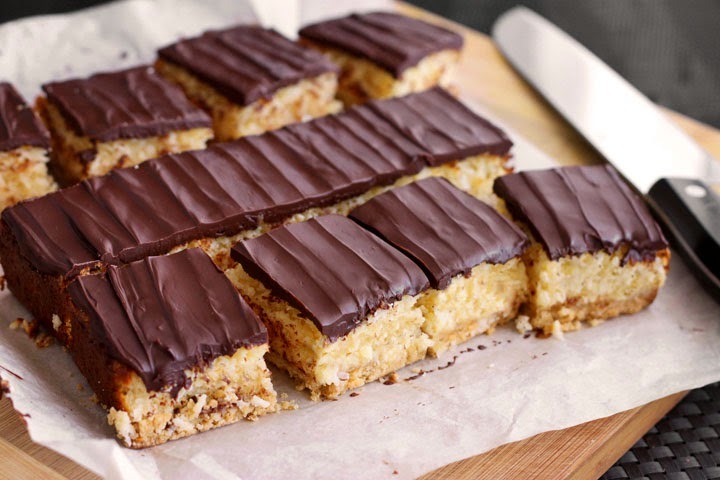 The bit of butter in the chocolate coating reduces its melting temperature to help soften it a bit and make for easier slicing at room temperature. Did I mention they're thick? They're monsters. Preheat oven to 350 degrees F. Line an 8-inch square pan with parchment paper, leaving an overhang on all sides. Set aside. Combine flour, brown sugar and salt in a medium bowl until evenly blended and there are no lumps of brown sugar. Add melted butter and stir until well combined. Press the mixture evenly into the bottom of your prepared pan and bake for 15 minutes, until lightly golden brown. Transfer pan to a wire rack to cool slightly while you prepare the filling. Reduce oven temperature to 325 degrees F.
Stir together shredded coconut, condensed milk, eggs and salt in a medium bowl until well combined. Spread evenly over slightly cooled crust. Bake for 20-25 minutes or until lightly golden. Set aside to cool completely. To make the topping, melt chocolate and butter together very gently in a small saucepan over very low heat until smooth. (Or, melt in the microwave for 30 seconds intervals on 50% power, stirring often). Spread chocolate evenly over top of cooled slice and then refrigerate until set. 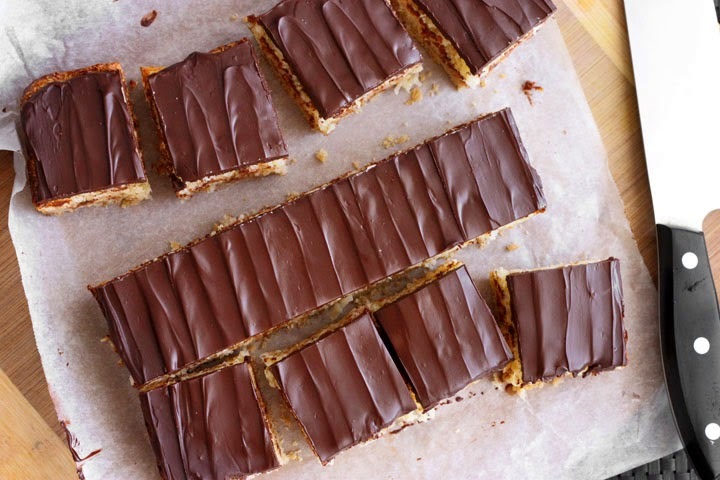 Cut into thick squares and enjoy with a cup of tea. The "Pin it" button seems to be working for me. Sorry, I'm not sure why it isn't working for you. 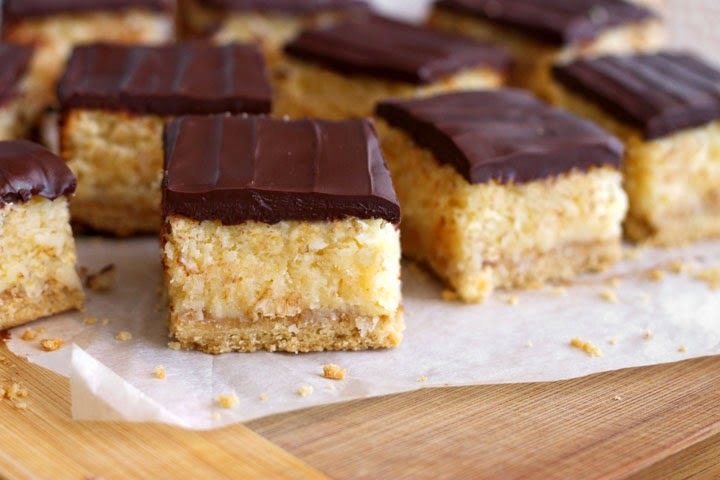 I stumbled across your recipe while craving bounty bars. I had no condensed milk so I made my own coconut based one by reducing a can of coconut milk with a bit of sugar and subbed that in - it was amazing! So coconutty. And my husband who doesn't normally like sweet treats has eaten most of it. Thanks for the recipe!